A patient has sued an ENT for failing to workup an asymmetric sensorineural hearing loss (nerve hearing loss greater in one ear compared to the opposite ear) that allegedly deviated from standard of care that ultimately led to permanent hearing damage and facial paralysis. Since January 2008, the plaintiff saw the defendant ENT who performed 3 audiograms that revealed an asymmetric sensorineural hearing loss. In 2010, the plaintiff suffered a sudden sensorineural hearing loss at which time an MRI scan of the head was performed revealing a "large" acoustic neuroma (benign tumor of the hearing nerve). 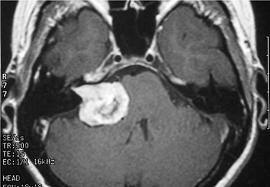 Resection of this tumor resulted in a visible facial droop, permanent hearing loss, and cognitive deficits due to partial removal of brain tissue. According to plaintiff, had the ENT performed MRI scan when asymmetric sensorineural hearing loss was first detected (presumably back in 2008), he never would have suffered from these defects. Read about the case here. Normally, if and when asymmetric sensorineural hearing loss is first detected, some type of workup is typically performed (auditory brainstem response and/or MRI scan of the head) unless there are extenuating factors present in the history. Such extenuating factors include old age and/or significant loud noise history that may lead to asymmetric hearing loss such as shooting (which often causes left greater than right nerve damaged hearing loss in right-handed shooters). Apparently THREE audiograms were performed over time. If there was progressive worsening of the asymmetric sensorineural hearing loss, than MRI should have been performed and/or at the very least an auditory brainstem response testing (ABR). IF the audiograms showed stable asymmetry over time, it can be argued that absolutely no further workup is needed. The key question in this case is had the defendant ENT obtained an MRI in 2008 when asymmetric sensorineural hearing loss was first detected, the acoustic neuroma would have been discovered earlier thereby preventing the permanent hearing loss he later suffered in 2010 along with facial paralysis and cognitive defects that occurred after surgical resection. 1) Acoustic neuromas grow at a rate of 1mm per year on average. As such, if the acoustic neuroma was large in 2010... it most certainly was large in 2008 being only 2mm smaller. 2) As such, surgical resection of the "large" acoustic neuroma had it been performed in 2008 probably would have resulted in the same outcome of permanent hearing loss, facial paralysis, and cognitive defects. Given it is established that the acoustic neuroma was large even in 2008, any type of intervention whether surgery or radiation, most certainly would put at risk the facial nerve which runs alongside the acoustic neuroma. Permanent facial paralysis and hearing loss most certainly is not an uncommon outcome after intervention. One could even argue that in all likelihood, ALL the defendants current complaints would have occurred 2 years more quickly had the MRI scan of the head and subsequent intervention been performed. Observation would have only lead to the current sequence of events. As such, did malpractice occur? Given the same outcome would probably have occurred, the defendant physician may argue that malpractice did not occur. Should the defendant ENT have ordered the MRI scan of the head back in 2008 when an audiogram he obtained showed the asymmetric sensorineural hearing loss? Probably though this might be debatable depending on patient's prior noise history and exact audiogram findings. Most definitely if the audiograms revealed a progressive worsening of the asymmetry over time. Most likely not if the audiograms remained the same over time. Would knowing there was an acoustic neuroma present in 2008 have changed the patient's ultimate outcome? Probably not given the large size.